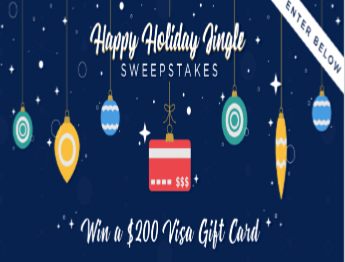 INSP The Happy Holiday “Jingle” Sweepstakes – Win a $200 Visa gift card! Win a $200 Visa gift card! ENTER SWEEPSTAKES HERE – INSP Facebook Sweepstakes page. ENTRY LIMIT – Limit of one (1) entry per person during the Entry Period. ELIGIBILITY – To be eligible, all entrants must meet the following requirements: 1) provide all information requested in the online entry form; 2) abide fully with these Official Rules, 3) be at least eighteen (18) years of age; and 4) be a resident of one of the 50 United States or the District of Columbia (excluding residents of Guam, the U.S. Virgin Islands, Puerto Rico, and other U.S. territories and possessions and where prohibited by law). ONLY ENTRANTS LOGGING ONTO THE INTERNET FROM WITHIN THE 50 UNITED STATES AND THE DISTRICT OF COLUMBIA ARE ELIGIBLE TO ENTER THE SWEEPSTAKES. YOU MAY NOT PARTICIPATE IF YOU ARE NOT A LEGAL U.S. RESIDENT AND PHYSICALLY LOCATED WITHIN THE UNITED STATES AT THE TIME OF ENTRY. SWEEPSTAKES ENTRY PERIOD – The Sweepstakes begins on December 3rd 2018 at 10:00 AM Eastern Time (“ET”) and ends on December 17th, 2018 at 9:59 AM ET. PRIZES – One (1) GRAND PRIZE WINNER: The prize package contains a $200 gift card. The Approximate Retail Value (“ARV”) of Grand Prize is $200 USD.